Today it is the birthday of Charles Fourier (1772 – 1837), the creator of a philosophy of a communal utopia, and strong believer in the power of architecture. 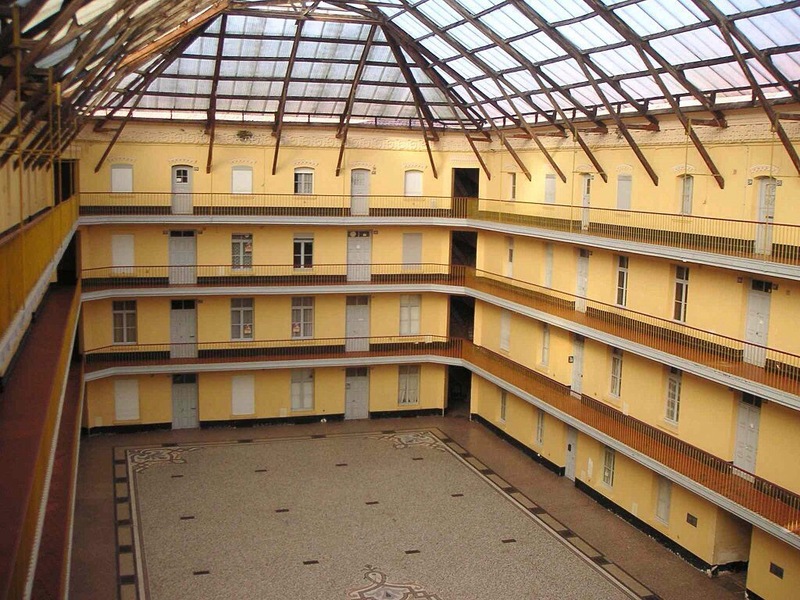 As an alternative to the traditional house, that perpetuated the oppressive traditional household with its inequality of men and women, he proposed the “Phalanstère”: a large communal appartment block in which the inhabitants would share the various resources in the building. Those included a theatre, a stock exchange, a winter garden and other extensive meeting places. The size of this great building would be determined by diversity: 810 different character types (the outcome of 12 common types of character) would be coupled, so that the building would ideally house 1620 people – that would be circa 400 appartments. The architectural model was the most splendid palace that he knew, Versailles (which, by the way, had 350 appartments, besides the royal quarters). The Phalanstère was eventually built in a modified form in Guise, by Jean Baptiste Godin. 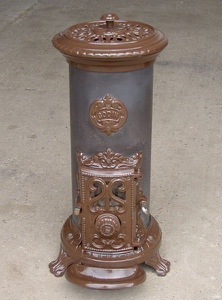 Godin was the inventor of a cast iron stove. He went on to establish a succesful business making cookers and heating stoves (a common model is known as the “petit godin”). 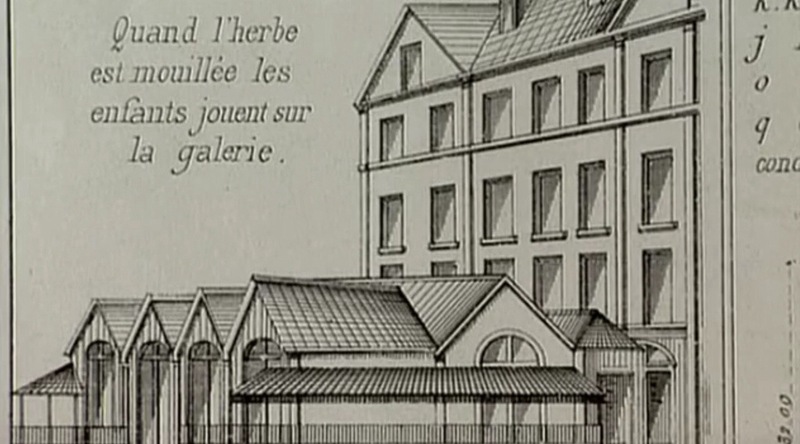 He embraced Fouriers ideas enthousiastically, and, in 1856, built a housing project for 900 of his workers, the Familistère. He fitted the buildings not only with a large communal court yard (as an indoor playground of the children when it would rain outside, a rather useful provision in Northern France), but with additional services he called “the equivalence of wealth”: a nursery, a primary school, a swimming pool, a laundry, a theatre, a shop that sold goods at a little over wholesale prices. A boss providing virtually every amenity for his workers may sound paternalistic. But Godin started out as an apprentice himself, in his fathers foundry when he was eleven, and, as a journeyman, got his share of bad housing conditions. In 1880 he converted the Familistère in a cooperative society. The foundry was owned by the workers. The building and its concept was succesful enough to last until 1968, when the cooperative society was dissolved. 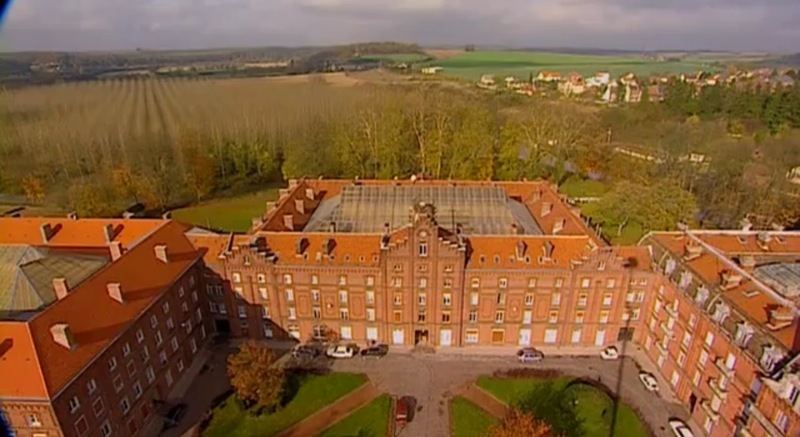 In Laken, outside Brussels, he established a second one in 1880, smaller in scale, that housed 72 units. And when you’re in the neighborhood of Guise, you can go and visit: Familistère.com. This entry was posted in architecture, urbanism and tagged architecture, Familistère, Fourier, Godin, Phalanstère on April 6, 2014 by Reine. 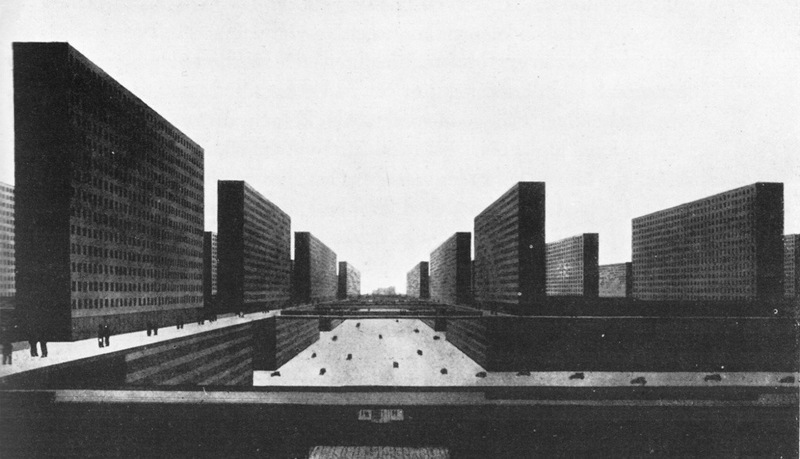 This is a design for a metropolis (in fact, Berlin) by Ludwig Hilbersheimer from 1927. It is a radical proposal for a solution of the problems of the exploding cities of the early twentieth century: bad housing conditions, congested traffic, unequal division of land and assets. As described in Manfredo Tafuri’s ‘Design and Utopia’, where I first met with this surprising design, the architectural object has simply disappeared. The living unit, the cell, and the city are one and the same thing. There is no notion of a traditional city space. Starting with the cell, the city is simply a multiplication of this basic unit and vice versa; the buildings are habitation and workplace and street as well. This city has no boundaries. It is a pattern that can be replicated endlessly, as needed. 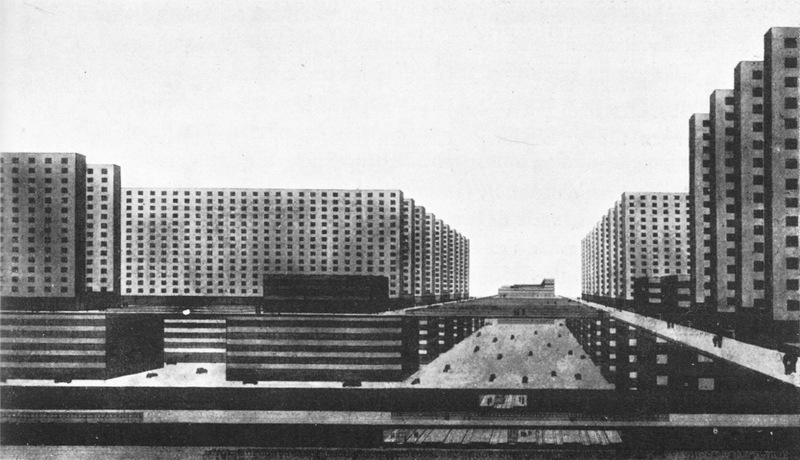 The blocks stand on a plane on which motorized transport moves, without differentiation, without streets or squares. Five floors of workshop are accessible from this level. On top of the workshops there is a grid of walkways, from which you enter the fifteen floor appartement buildings. These buildings have the rigorous layout of a rental office: elevators, stairs, corridors. Off of these corridors are the apartments, the living cells, defined by the number of bedrooms – from one to six. I was struck, revisiting this project, with how much this design actually reflects in a way how a large, and increasing, part of humanity lives. Nowadays it seems that most people live a fleeting life, their living place in a state of flux. So they may become home owners, but, next to the agreeable living quarters they wished for, their house is also a commodity. The type of wall finish, the amount of rooms, the way the kitchen is laid out, are for a considerable part dictated by the inevitable moment that the house has to be sold, and its inhabitants move to the next place. In Hilbersheimer’s project the final consequence is faced: you enter these appartements with nothing but your suitcase and leave it the same way. Beds, kitchen, cabinets for storage of your belongings, are already present. 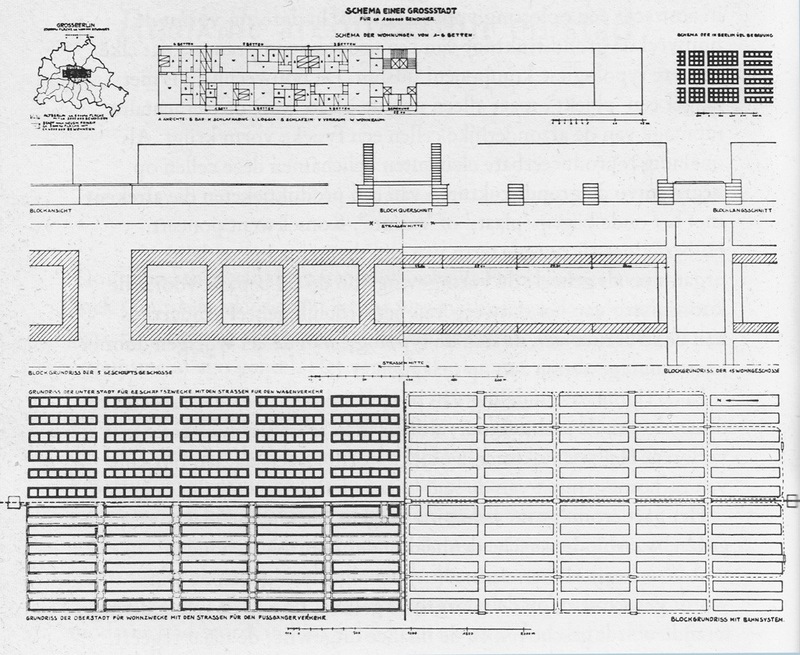 Hilbersheimer’s plan may look like a cartoon image of the way of living of today. But this plan has also a striking difference: the places for work and those for living are on top of each other. This, surprisingly, harks back to the oldest way of living, your home next to or on too of your shop or atelier. So there is room form traffic to go around but there is no need to commute. Here a pre-modern arrangement is at the heart of an ultra modern city. Heidegger wrote (in Bauen, Wohnen, Denken) how building and living are at the heart of our existence on earth. The German word ‘bauen’ points to ‘raising’ as in raising crop. ‘Wohnen’ is being in a space, a place that is created by living. Not a space in a technological sense. He says “space and men are not across from each other though. She is neither an external object nor an inner sensation”. “Space is included in the designation ‘man'”. Living (‘wohnen’) should provide for the receiving of the foursome, heaven and earth, mortals and gods. This notion of the ‘geviert’ (which I translate with foursome) is a very complex one that I’m only beginning to explore. But for now I think I understand that with this notion he provides a space for the spiritual, or whatever is beyond the subject, as well for the subjective world – and without pulling these apart. Is there room for such a space? Heidegger presented his thoughts in a lecture right after the war, and the housing shortage was an urgent issue. He points out though, that even with the building of new housing there is moreover a longing for the actual ‘living’ – and this living is not confined to the home but also present in the workspace, everywhere where man and place are present. Looking at the rigorous plan of Hilbersheimer I thought that at least one thing was right, which is that it suggests how living and working can be combined. It may not be necessary to reach for the suburban alternative to make a place. It may be a way to reconsider the new megametropoles, the multi million inhabitants cities that are now an unerasable given, and look for the possibility to create a place for humans to truly live there. A huge leap of faith is necessary. Of course, the chilly uniformity, the absence of even one blade of grass, the total lack of fun, shouldn’t be replicated. The ‘Hochhausgrossstadt’ is a schematic proposal that is very much concerned with the production side of how to build a good city. I think it can open up the thinking about cities into a perspective to an alternative to cities that are still laid out in a wasteful and inorganic way, needing too much traffic to function, taking up too much space. Maybe this inhuman looking city may provide a way to a truly human city. This entry was posted in architecture, urbanism and tagged city, ecology, Hilbersheimer, metropolis on January 1, 2014 by Reine.